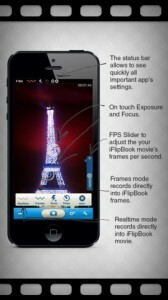 iFlipBook is an iPhone app developed by HyperSense Software. Featuring a simple, easy-to-navigate user interface and a solid design, iFlipbook is perfect for users who want to turn their photos into a funky “flipbook” video. By compiling different photos and videos together, iFlipBook lets users create flipbook-like creations that can chronicle a crazy night out or a creative night in. There’s even a grid system to help you line up each shot perfectly, creating a high-quality and enjoyable flipbook memory. Additionally, there are 27 different effects which users can overlay onto their creations to make them even more unique. I like that you can adjust the frame rate with a simple FPS slider located in the right side of the camera screen. 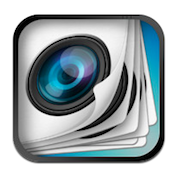 iFlipBook supports both real time video recording and direct frame-by-frame recording, and you can also upload old pics from your Camera Roll as well. Supporting sharing options for your iFlipBook creations include Facebook or YouTube. You can also email your flipbooks directly from the app to all of your friends, creating a great way to memorialize a particularly epic birthday bash or road trip. There are a couple of aspects that might turn some users off. First and foremost, for best results, you really need to be making these flipbooks during daylight, and with a steady hand/tripod. In low light environments, there is a built-in light that can help focus the camera a bit better. Longer flipbooks can take a really long time to process, so make sure you’re near an outlet so you don’t totally drain your battery. 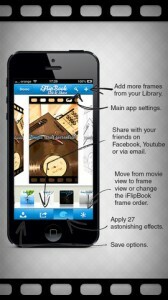 iFlipBook is currently free, but the price reduction will only last through the winter holidays. So, if this app has been on your wish list for a while, act now to snag it before the price jumps back up. There’s never been a better time to try out iFlipBook, and it really is pretty fun to play around with. Don’t miss out! iFlipBookis compatible with iPhone 3GS, iPhone 4, iPhone 4S, iPhone 5, iPod touch (3rd generation), iPod touch (4th generation), iPod touch (5th generation) and iPad. Requires iOS 5.0 or later. This app is optimized for iPhone 5.